The Salesforce ScreenSteps Live application is an application you install into Salesforce. The app will let you add contextual help along the left sidebar for standard objects, custom objects and custom pages. 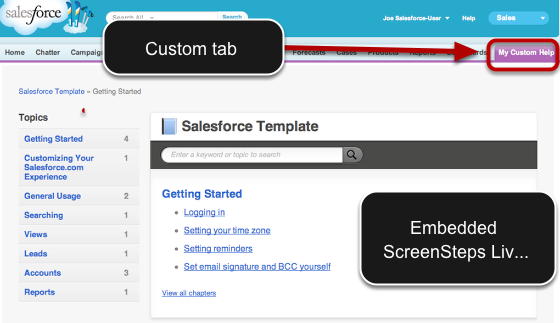 If your plan does not include the Salesforce ScreenSteps Live application, you can still add ScreenSteps Live to your Salesforce site by creating a custom tab. 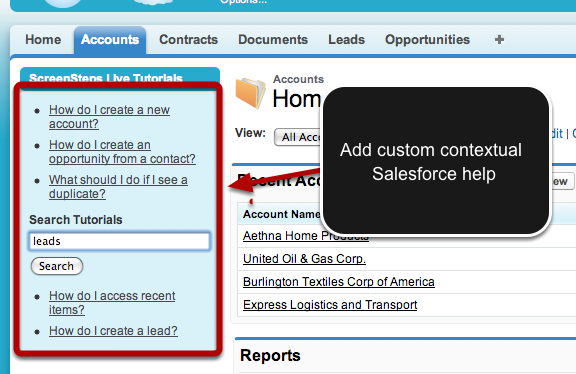 You won't be able to display any context sensitive help, but your users will be able to quickly access and search your ScreenSteps Live site from within Salesforce. Prev: Can ScreenSteps export to Desk.com?